A2 Hosting was founded in 2003 and currently places itself as a high-performance, high-speed, customer-focused web host. They offer a wide selection of hosting services, including shared hosting, VPS hosting, cloud hosting, and more. Being an independent hosting company (e.g. not owned by a larger company) can be tough. However, A2 Hosting, like SiteGround, have shown that they don’t need another company to make them successful in the hosting world. This customer is extremely happy with their A2 Hosting services for their business. So happy in fact, they’re considering moving their personal sites over to A2 Hosting. 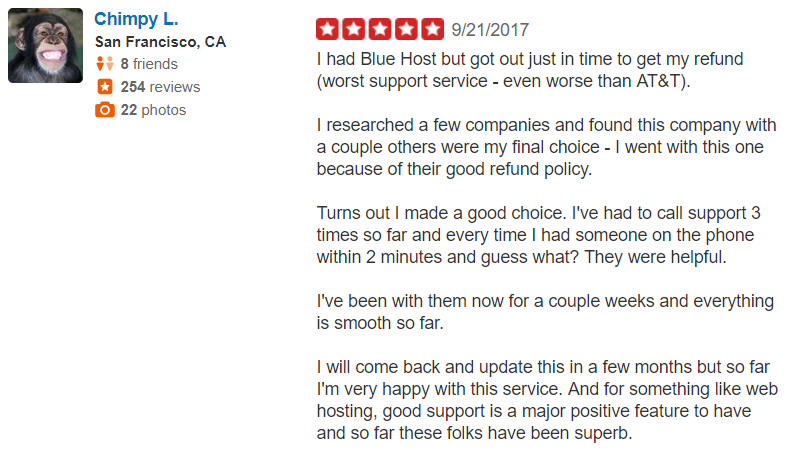 Initially choosing A2 Hosting because of their refund policy, this dubious customer has confidently reported a great experience with A2 Hosting. Seems like a good choice so far, so I’m going to dive in and experience this for myself! A2 Hosting constantly remind existing and potential customers of their Turbo servers: “They feature up to 20X faster page loads compared to competing web hosting services“. You’ll see this kind of information plastered across their website! Obviously speed is important when it comes to web hosting. You want your visitors to access your website within a 3 second loading time to ensure they don’t abandon your site and go elsewhere! Figures show that the abandonment rate after 3 seconds increases rapidly. I signed up to A2 Hosting just before the summer of 2018. I wanted to monitor my website’s uptime performance so that I could accurately report my findings to help you! My reviews are unbiased and intended to provide facts so that you can make an informed decision. Over the space of 1 month I experienced a 99.96% uptime with my website hosted on A2 Hosting. Granted, it’s not 100% uptime, but it’s pretty damn good considering my test website was on their shared hosting plan with a basic install of WordPress (without any optimisation). A2 Hosting guarantee a 99.9% uptime commitment, and in my experience this rang completely true. I’ll continue to monitor my test website’s uptime and report back regularly! A2 Hosting admittedly do boast about their performance and speed technology quite a lot. But, I think there’s a really good reason for them to do that! They offer some features that take them from a good web host that’s reliable, to a a great web host. Let’s take a look at some reasons why. Turbo Server Option: A2 Hosting give you the option to use their Turbo Servers. This is the feature that advertises 20x faster page loading speeds. That’s some fast speeds compared to other web hosts. Turbo servers have less users and therefore more resources to allocate to each account. A2 Optimised Tool: This tool is for the exclusive use of A2 Hosting customers. It will allow you to setup solutions like Memcached, OPcache, and Turbo Cache on shared hosting accounts. Much like 1-click installs, these 1-click options make for a fast and easy user experience. Caching solutions are essential if you’re attracting website visitors from around the world. Say your hosting server is based in the U.S.A. but a lot of your customers are based in Singapore or the U.K., caching allows all your visitors to access your website with the same (or similar) loading speeds. Solid State Drives (SSDs): A lot of web hosts still use HDD, which is a much cheaper option for them, but it’s not a good option for their customers! A2 Hosting use SSDs for free on all of their web servers. Their SwiftServer platform features up to 300% faster page loading times compared to HDDs. Customer support is vital when it comes to most industries, including web hosting. After all, web hosting isn’t necessarily a simple process – it can be difficult to understand and technology inevitably goes wrong! It’s important to have a point of contact, and even better if someone is available 24/7. There are a variety of ways to contact A2 Hosting; they conveniently split their customer service into categories dependent on who you want to speak to, and what about. What’s more, they have the live chat feature – this puts them in my good books for sure! 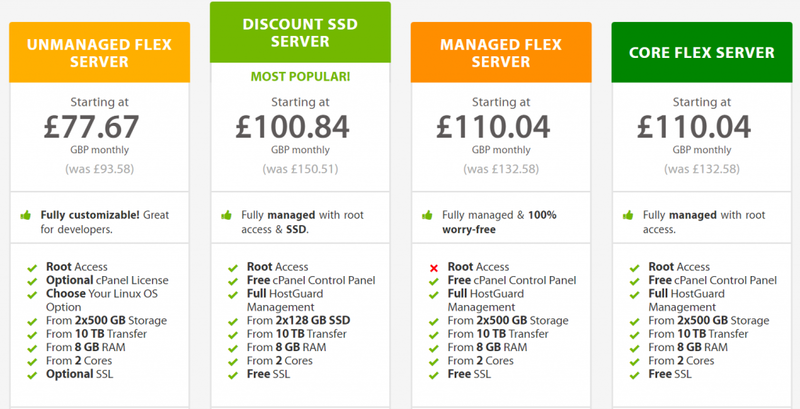 Across this review, I’ve been looking at the features A2 Hosting offer. I’ve also shown you some real-time data regarding their performance statistics when it comes to live servers. So far, I think you’ll agree that A2 Hosting are a very versatile web host who really focus on their customers. What I want to do now is cover the overall pros and cons of A2 Hosting and how that affects their customers (namely me and you)! This should give you an overview in order to make an informed and unbiased decision as to whether A2 Hosting is the perfect web host for you. A2 Hosting provide a 99.9% uptime guarantee. I’d say around 80% of web hosts now make promises regarding their SLAs, which is definitely good for customers like us. Having a guarantee that my website will only experience 0.1% downtime is extremely reassuring. Their 99.9% uptime guarantee also covers when A2 Hosting perform planned outages and scheduled downtime. They’re very open and honest about their commitment to their customers which shows that they actually care. Yes, you read that right, A2 Hosting promise an anytime money-back guarantee. This web host encourages you to try their services absolutely risk-free (another great sign that they’re confident in their features). A2 Hosting will provide you with a full refund if you cancel within the first 30 days (pretty normal for web hosts nowadays). But, the best part is, if you go over the first 30 days and still want to cancel, a refund will still be offered on a pro-rata basis. This is an insanely good feature if you ask me! Probably one of my favourite features that A2 Hosting offers is their turbo boost option. 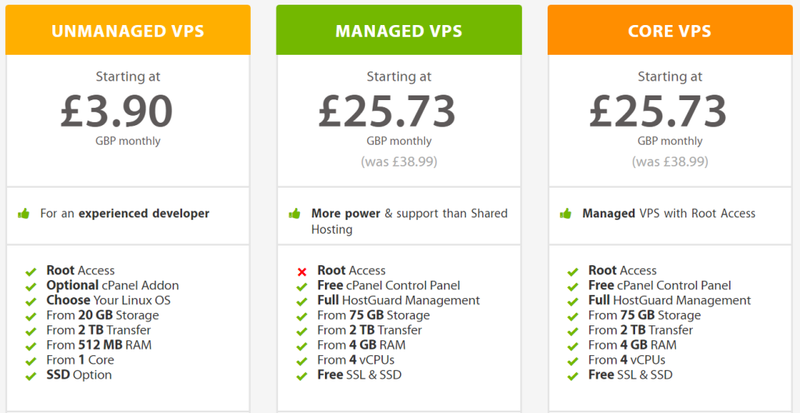 Some hosting plans already include this for free, whereas others can be upgraded to include it. Turbo boost promises up to 20x faster speeds compared to other web hosts! Turbo Cache: All HTML contents of a web page are cached to ensure 20x faster page loading speeds. We know how important page loading times are, for both desktop and mobile visitors to your website. APC/OPcache: This feature can cut PHP web page response times by half. All installs are pre-configured with PHP 5.5 or later. Memcached: MySQL databases on your website will experience a speed increase. A2 Hosting clearly offer great performance features. But, they also care about their customer’s security! HackScan Protection is included in ALL hosting plans absolutely free of charge. HackScan is a malware protection service. It runs 24/7 to ensure your website and server are safe from attackers. The idea is that HackScan will block an attack before the damage is done to your website. A lot of web hosts offer site migrations from other hosts. The issue is, a lot of them also charge for this service which is madness. The process itself doesn’t take long at all, and is essentially compiling existing files and data and transferring them from one server to another. A2 Hosting offer this service for free! All you have to do is contact their Guru Crew who are available 24/7 in order to transfer your website from your current host, over to A2 Hosting. If I had to be picky about A2 Hosting (and this is really picky in the grand scheme of things), they’re not as affordable as other web hosts. 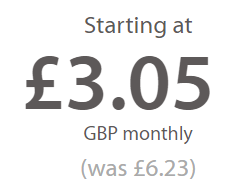 Granted, they are still cheap, but other hosts do offer similar features from around £1.50 per month. On the other hand, there are no limits in terms of data and bandwidth (though unlimited isn’t really necessary for a small site). 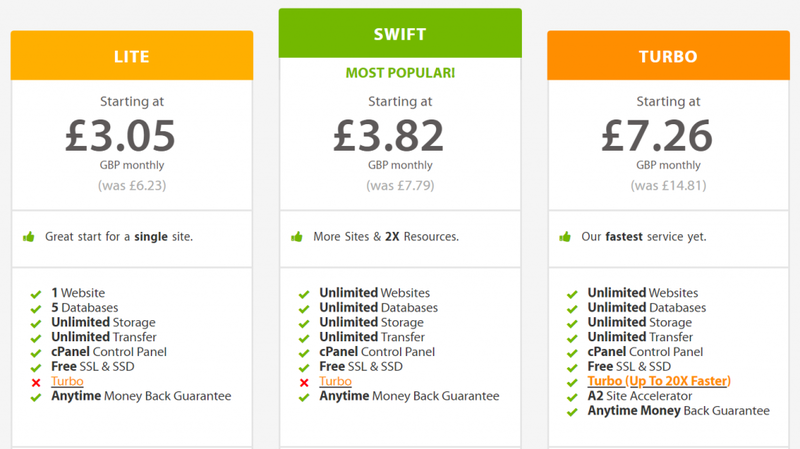 All of A2 Hosting’s shared plans include the option to upgrade to their Turbo server option, at an extra cost. This excludes their Turbo plan, as the Turbo option is already included. All accounts have access to 24/7 Guru Crew support, free website migrations, anytime money-back guarantee, and a 99.9% uptime guarantee. High performance VPS hosting is ideal if you want more control over your web server. For example, if you’re running a business, this may be more suitable than shared hosting. There are 3 different options to choose from with A2 Hosting’s VPS hosting; managed, unmanaged, and core. Are you ready to start selling your own web hosting? Your customers, much like me and you, rely on uptime and performance. Choosing a reseller hosting plan requires just as much thought and research as other hosting options. After all, you wouldn’t want your customers to have a poor experience would you? A2 Hosting’s reseller accounts also include the Turbo Servers option, which is a great choice if you want to be a reliable reseller. There are several dedicated server options for you to choose from with A2 Hosting. A variety of unmanaged and managed servers, so you can have an entirely worry free experience. As with all hosting plans, you’ll have access to A2’s Guru Crew support, high-performance servers, and a 99.9% uptime guarantee. I’d not really done a lot of research on A2 Hosting until I signed up to them to write this review. In short, yes I do recommend them! Using my own hard-earned cash, I signed up to A2 Hosting in order to provide an unbiased review for other potential customers. On the face of it, A2 Hosting might not seem as flashy as other hosts, but they certainly offer a wealth of features. From bloggers to eCommerce businesses, you can start your website journey for the price of a coffee. For me, A2 Hosting take things one step further. They offer 20x faster speeds, and consistent, reliable performance. They don’t slack on safety, security, or customer service either! It’s like they’ve taken all the points of other web hosts and combined them into one to make an absolutely awesome web hosting package.